Prepare to be blown away by Toulon—both literally (the climate is distinctive for more than 30 different types of wind that blow in from all points) and figuratively (by the many charms of this ancient port). Toulon is the capital of Provençe, so you can find specialties like lavender, wine and fine herbs at one of the best markets in all of southern France, the Cours Lafayette. Indulge in plenty of fresh seafood and tasty treats like chichi frégi, a type of donut, and cade toulonnaise, a savory pancake made from chickpea flour. And if you need help working up an appetite or working off lunch, head to boulevard Amiral Vence and jump on the cable car which will lead you almost 2,000 feet up to the top of Mont Faron. Not only will you get spectacular views of the city from the summit, but you’ll also be able to visit the Mémorial du Débarquement en Provence, dedicated to the 1944 Allied Forces’ landing in Provençe. Just make sure to check which way the wind is blowing—and how!—before you make any Mont Faron plans; even the running of the cable car is subject to Toulon’s infamous winds. Wander the narrow streets and small squares of old town Toulon, a pedestrian area famed for its abundance of fountains. Take in the impressive art in the Toulon Cathedral and be sure to explore the daily market on Cours Lafayette, featuring wonderful local products. For great hiking paths and panoramic views of the town and the Mediterranean, take Toulon's cable car to the top of Mount Faron. 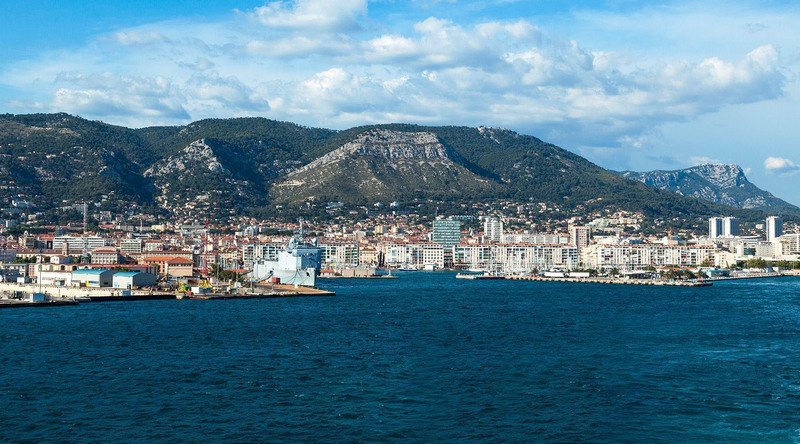 Experience the highlights of Toulon from one of two tourist trains, offering guided tours of the Mourillon beaches, Tour Royale tower, Toulon’s naval base, and the historic quarter.